Digital portable indicators for the difference between two pressures. They can also be used for single pressure. 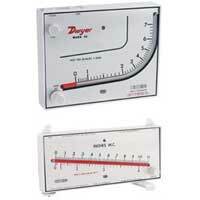 Dwyer's digital manometers are versatile, handheld, and battery operated manometers. Manometers are useful in a wide variety of applications. Some units are constructed of an extruded aluminum case for exceptional durability. Intrinsically Safe Handheld Digital Manometer measures air and natural gases. Applications include field calibration of other instruments, monitoring or troubleshooting HVAC systems. Handheld Digital Manometer is designed to measure a wide range of pressures to a high accuracy. Applications include calibration facilities and laboratories. Digital Manometer can be used to measure low pressure. Constructed of extruded aluminum case. Precision Digital Pressure Manometer is designed to measure and log pressure measurements. Ideal for laboratories and calibration facilities. Differential Pressure Modules transmits to Model UHH2 to view pressure drop across filters and velocity pressures. The module mounts in the holder on the back of the handheld, or in an optional mounting bracket. Handheld Digital Manometer are available with pressure, flow, and velocity measurements. 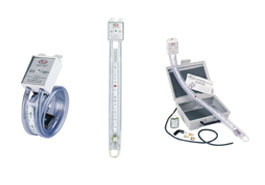 Applications include duct static pressure and air flow monitoring. 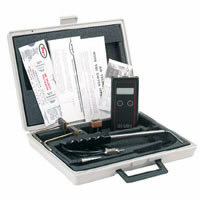 Hydronic Differential Pressure Manometer is a versatile, handheld, battery operated manometer. Applications include chiller to coils for freeze protection and hydronic valve balancing. Handheld Digital Manometer is a versatile, hand-held, battery operated manometer. Applications include lab calibration. How does a manometer measure gage and differential pressure? Manometers simply measure the pressure by indicating the amount of displacement a liquid of known weight undergoes when a force is applied. This concept is best explained through illustrations in our Bulletin D-21 or in our Application Guides on how to use pressure products. Can a Slack tube manometer be used for water pressure? That style of manometer is to be used with air/gases only. If you need something that reads water pressure, you would want to use something like our Series 490, Series 490A or Series 1211/1212. What's the sample rate of the 475 digital manometer series? Is there an average function of the the past samples? The sample rate is 1 reading per second. There is no average function of past samples. Is there a manometer that is compatible with chlorine gas and sodium hydroxide (bleach)? Unfortunately, we do not have any manometers available that can handle chlorine gas or sodium hydroxide (bleach). My new Series 476A Digital Manometer scrolls through random numbers and letters like OFL after I tried to zero it. How do I fix it? The 476A will continually display OFL if it has been over pressurized. Feel free to contact our customer service department to setup an RMA if you’d like it repaired.